Balega socks are my favorite running socks. I don't care nearly as much about what 'm wearing on my head or anywhere else, as long as I have a good pair of running socks. A running sock should be comfortable, stylish, and being a heavy stepper, I also like a little cushion in my sock. 1) They're made out of a great material. It's a moisture-wicking fabric so my feet don't chafe, it's so comfortable and it's thin enough that I don't have to buy even bigger running shoes just to fit them over my socks. 2) They fit well. While other running socks I've worn felt tight and squeezed my toes, these socks fit very comfortably. 3) The top of the sock comes up just high enough. This is a crew sock, but the top of the sock comes up just above the back of my shoe so that I don't get any blisters from my shoe. ooking to purchase a pair of running socks? 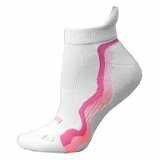 Check out Amazon's prices for the Balega running socks here.